MACOMB, IL – The vocal group VoicePlay will perform at 7:30 p.m. Thursday, Nov. 2 at the Western Illinois University Union Grand Ballroom as part of the annual BCA schedule. The group, which performs an entire musical production with only their voices, appeared on season four of NBC's "The Sing-Off." The Florida-based group began as a street corner barbershop act and has evolved into an internationally acclaimed touring sensation and video entertainment brand. VoicePlay's "music-without-music sound ping-pongs between eras and styles." 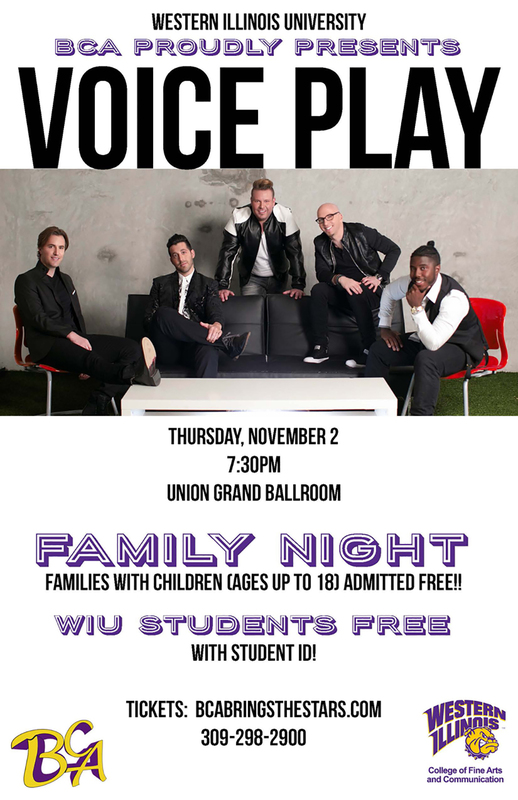 Tickets are $15 for the public, $10 for senior citizens, WIU employees and youth and free for WIU students who present a valid student identification card. To purchase tickets, visit BCAbringsthestars.com.